Trip Summary is Vecto Technology's premier online travel itinerary template builder software. Our online travel itinerary maker, Trip Summary, allows travel agents to build and send visually pleasing itineraries to clients using various travel itinerary templates. Vecto's travel itinerary templates are complete with flights, transfers, hotels, cruises, and any other reservations made through the online, and offline booking process..
Customizable imagery for itinerary maker. Upload your own personal images and use the integrated cropping tool to perfectly frame the shot. Travel Agency notes in itinerary maker. Add in custom notes for component types to make sure clients have all the information they need while traveling. Input component bookings allowed in itinerary maker via email! Forward booking confirmations to a custom email address, and access it in Trip Summary. Trip Summary provides your travel agency with many options to send itineraries to clients. Travel itineraries built using our travel itinerary software maker, Trip Summary, can be downloaded as PDFs, viewed in a web browser, or embedded in an email for clients to retrieve. 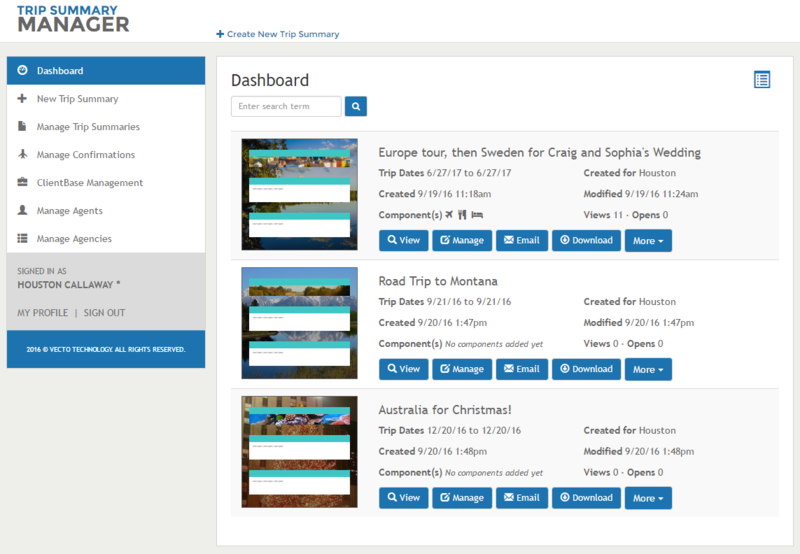 An itinerary created in Trip Summary's itinerary template maker also comes with incredible imagery options. Trip Summary, our travel itinerary software, also supports custom travel components, for travel itineraries that don't quite fit the mold. Trip Summary also has seamless integration with our powerful travel booking software, RezSaver. When used together, RezSaver and Trip Summary provide an integrated travel software solution. From travel agent management to client base management, as well as travel booking, to itinerary maker. With roots planted in travel technology development, Vecto Technology understands exactly what it takes to provide quality travel technology solutions that benefit the travel agency, advisor, and client. Complete our Request More Info form to get in touch and make Trip Summary your travel itinerary software.